Beer and bar snacks and books, oh my! I discovered while I was living in Boston that I really like reading in bars. Boston is a very good place to discover this because in Boston I feel like basically everyone does everything in bars at all times. That was my experience anyway. So reading in bars is good. And reading at the bar in a bar (that wasn’t a typo, I mean as opposed to at a table) is the best possible scenario because bartenders are great people that will let you talk to them sometimes in exchange for tip money. So all was well in Boston with bars and the reading. But then I left Boston, and in New York I had some trouble. New York doesn’t feel like the kind of city where it’s okay to just sit alone at a bar with a book, because it feels like people are just looking at you all the time, expecting you to be cool. 1) Music: not too loud, not too annoying. 2) People: not too loud, not too annoying. 4) You know what’s even better than reading at the bar in a bar? Reading in the window in a bar. You can just sit in the window and alternate between people-watching and reading, and it’s fabulous. Except for that one time when a dude reached through the window and ate one of my (free! delicious fried chick pea) bar snacks out of my bowl. That was weird. 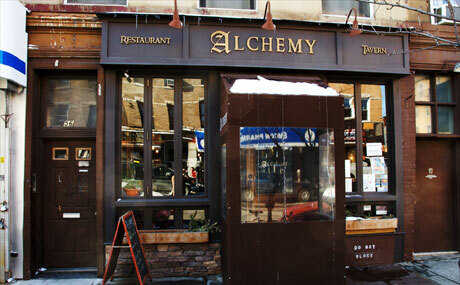 This entry was posted in May 2015 and tagged alchemy, bars, May 2015, park slope, reading spots. Bookmark the permalink.